Radiologia i diagnostyka obrazowa odgrywają istotną rolę na wszystkich etapach leczenia chorych na nowotwory złośliwe. Właściwe wykorzystanie metod diagnostyki obrazowej nie tylko poprawia wyniki leczenia ale także ma pozytywny wpływ na koszty leczenia. W wyborze metody diagnostycznej optymalnej dla chorego i problemu klinicznego decydujący głos powinien mieć radiolog. Przez wiele lat badania radiologiczne oraz ultrasonograficzne były obrazowaniem strukturalnym, przedstawiającym cechy morfologiczne tkanek prawidłowych i rozwijających się w nich procesów patologicznych. Nowe metody radiologii i diagnostyki obrazowej pozwalają na obrazowanie strukturalne i czynnościowe także nowotworów. Obrazowanie czynnościowe dostarcza danych ważnych dla leczenia chorych na nowotwory złośliwe. MR – najlepiej z dostępnych obecnie metod – łączy obrazowanie morfologiczne z czynnościowym i w pewnym zakresie umożliwia obrazowanie molekularne. Diagnostic imaging has an important role in all stages of management of oncologic patients and its proper application leads not only to improved treatment results, but also to increased cost-effectiveness. The great number of currently available imaging modalities causes that this just the radiologist is to have decisive opinion in selection of the diagnostic method of choice for the given patient, diagnostic problem or clinical issue. Słowa kluczowe: radiologia i diagnostyka obrazowa, obrazowanie w onkologii, rezonans magnetyczny. Key words: diagnostic imaging, oncologic imaging, magnetic resonance imaging. Detection, i.e. visualisation and noticing of a lesion is the first step. Detection of a neoplasm depending on the quality of the device and perception by a radiologist has recently sometimes been aided by CAD (computer aided detection) systems. Clinically, CAD systems are used in mammography, computed tomography of the lungs to detect nodules and in CT-colonography. CAD reduces the perception error, but it cannot affect interpretation errors. The next one is interpretation, characterisation the lesion – differential diagnosis of benign and malignant lesions. There is a special role in neoplasm detection to be played by screening. Diagnostic imaging is used mainly in breast cancer screening. Breast cancer screening by X-ray mammography is a procedure of well-documented effectiveness in reducing breast cancer mortality. Mammography?s sensitivity ranges – depending especially on the breast structure – from 68 to 93% and it is higher for diagnostic mammography than in the case of screening mammography. About 10% of cancers are mammographically occult, even if they are palpably detectable (1). The most frequently, cancer remains undetected in dense, glandular breasts, and this is why it is more and more commonly argued that another screening method is needed. This method cannot be hand-held ultrasound. Tomosynthesis and automated volume breast US are currently tested for their application in breast cancer screening. Early detection of lung cancer by low-dose CT is still rather the subject of clinical studies. Detection of a neoplasm, interpretation of the image and characteristics of the found lesion requires usually a multimodality approach and even then, biopsy is often necessary for the final diagnosis. It can be probably said that many modern methods of diagnostic imaging are more sensitive than specific, e.g. only 25-45% of lesions qualified mammographically for biopsy are confirmed to be cancers (2). Traditionally used uni- and bidimensional methods are insufficient and currently volume of the tumour is calculated more and more frequently. Regardless of the applied method, it is necessary to delineate the tumour in order to calculate its size. Delineating of neoplastic infiltration in diagnostic imaging may be difficult and location of the tumour-normal tissue border changes depending on the used modality (3). Differences in lesion size between morphological and metabolic imaging (1HMRS) have been reported in brain tumours (4). This is also essential for planning surgical treatment as well as radiotherapy. C. metastases to lymph nodes and distant metastases. Apart from the classical 18FDG PET/CT whole body imaging, whole body MRI is applied more and more often. It must be remembered that metastases < 2 mm are currently impossible to visualise in diagnostic imaging. Biopsy: selection of the biopsy site and guiding (imaging guided biopsy). Presently, all types of biopsy are guided by imaging modalities. Imaging is especially important in the process of selecting the sampling site in brain tumours considering their histopathologic heterogeneity and difficulties in obtaining larger specimens. Such an examination should include classical MRI, but also DWI-MR (diffusion weighted imaging), 1HMRS, angiogenesis imaging. – white matter tracts – DTI method (Diffusion Tensor Imaging). Neuronavigation using MRI and CT sections improves markedly precision of the surgical procedure and is a more and more common tool. As Nimsky wrote in 2005: “Despite decreasing non-eloquent space for resection, it is out of doubt that today tumours are operated, which we thought we should not operate on only 10 years ago” (5). 4C. Local treatment of primary and metastatic tumours intra-vessel embolisation of malignancies, ablation, radiosurgery. MRI-guided (high-intensity) focused ultrasound (FUS, HIFU) – method based on delivering big quantity of acoustic energy to the selected structure (neoplastic tumour) which causes heating, acoustic cavitation and mechanical force (6). In this procedure, MRI serves not only planning (delineating of the tumour) and monitoring of treatment effects, but it also provides real-time in vivo body temperature maps. On one hand, this is crucial for efficient ablation and on the other hand – to prevent damage to normal tissues. This method is applied in clinical practice to treat uterine fibroids, while its application in management of other tumours (brain, liver, breast, kidneys, prostate) and in pain palliation in bone metastases is under investigation. Monitoring and prediction of treatment response (fig. 1, 2). Fig. 1. PNET – treatment response A, B, C: before radio-chemotherapy (May 2009): (A) – ADC map (mean ADC 0,4-0,5 x 10–3 mm2/s), (B) – blood volume map; rCBV > 3,5; (C) – T1-weighted CE image D, E, F: after radio- chemotherapy (August 2009): (D) – ADC map – mean ADC 0,9-1,1 x 10–3 mm2/s is higher in comparison with previous examination, (E) – blood volume map; rCBV 1,5-2 is lower than in previous examination, (F) – T1-weighted CE image. Fig. 2. Sinonasal undifferentiated cancer – treatment response A, B before chemotherapy: A – T2-weighted imaging, B – ADC map (mean ADC = 0,5 x 10–3 mm2/s) C, D during chemotherapy: A – T2-weighted imaging, B – ADC map: ADC had increased significantly (mean ADC = 1,8-2 x 10–3 mm2/s). Assessment of treatment efficiency – diagnosis/exclusion of presence of a persistent neoplasm after completed therapy. The radiologist?s knowledge of treatment date and treatment methods applied in the patient is necessary to make this assessment. As in the case of early detection of a recurrence, it is necessary for the radiologists to know the image of lesions expected after the applied treatment and of complications. A. Identification of relapse, recurrence or metastases as early as possible. B. Diagnosis of WHO II gliomas? malignant transformation as early as possibleMajority of (all?) WHO II gliomas will progress to high-grade tumours and it is oneof the crucial tasks of the contemporary radiology to identify the transformation asearly as possible. The most efficient modalities for predicting the transformation are: PWI and 1HMRS. Transformers reveal a significant increase of rCBV about a dozen months before transformation is visible clinically and in conventional diagnosticimaging (before contrast enhancement is apparent onT1-weighted images) (7). As reported in the paper by Law M et al. in 2006 “Lesions with relative CBV less than 1.75 had a median time to progression of 4620 days ? 433 (standard deviation), and lesions with relative CBV more than 1.75 had a median time to progression of 245 days ? 62” (8). Detection and monitoring of early and late complications after treatment. For many years, radiologic studies were structural imaging, presenting morphological features of normal tissues and pathologic processes, including neoplasms in these structures. Diagnosing based on classical (morphological) modalities: radiography (x-ray imaging), CT, ultrasound and conventional MRI (T2-weighted, PD, T1-weighted without and with contrast enhancement) is based on detection of structural/anatomical abnormalities and/or abnormal contrast enhancement. X-ray mammography remains the key and basic method of breast examination, both in screening and in women with clinically suspected breast cancer. The main development of x-ray mammography in the recent years concerns introduction to everyday clinical practice of full-field digital mammography. The main advantages of the digital mammography are: higher contrast resolution and improved dynamic range, elimination of many artefacts, possibility to apply CAD systems (computer aided detection) and PACS (Picture Archival and Communications System) systems. The latest x-ray mammography technique is tomosynthesis. Its result is presented as a series of high-resolution thin slices. Among the possible advantages (this is a new method and it is still intensively investigated) of application of breast tomosynthesis there are: improved cancer detection, reduced number of recalls and biopsies. For a dozen or so years functional and molecular imaging defined by Hoffman JM and Gambhir SS (9) as “the in vivo characterization and measurement of biologic processes at the cellular and molecular level” have become a part of radiologic imaging examinations, especially MR. A combination of morphologic and functional examinations allows above all for a better answer on the basic question in cancer patient diagnosis: is the visible lesion a malignant tumour (primary, persistent, recurrence, metastasis), what is its size, is the applied therapy successful. Discussion of the main functional imaging modalities used nowadays (PET and SPECT) goes far beyond this paper. All imaging modalities used in radiology and diagnostic imaging have developed significantly lately. Computer tomography is currently the most frequently applied imaging modality in oncology. MDCT (Multidetector Computer Tomography) combines very good spatial (< 1 mm) and time resolution. This offers a possibility to obtain reconstructions in any plane of the same quality as in the case of primary images, and to perform angiography/coronarography, dynamic examinations and CT perfusion. An important limitation of dynamic studies and CT perfusion concern the dose of ionising radiation. Computer tomography added to the PET system (PET-CT) has markedly improved specificity of positron emission tomography. From the oncologic point of view, the most important developments in ultrasound in recent years include introduction of contrast agents and elastography. The latter is used most frequently for differential diagnosis of breast lesions, it may be applied also in examinations of the liver. It is important that it has changed from a qualitative into a quantitative method. But the greatest improvement has been observed in the recent years in magnetic resonance. MRI best combines – among the currently available methods – possibilities of morphological and functional imaging and – to some extent – it offers a possibilities of molecular imaging (9). New techniques of MRI have not only improved morphological imaging, combining excellent tissue resolution with very good spatial (< 1 mm) and time resolution, but they have also made functional studies possible. Especially intensively investigated MRI techniques concerned in oncologic diagnostics are: spectroscopy, diffusion imaging (DWI – diffusion weighted imaging), tumour vascularisation imaging (dynamic imaging and perfusion weighted imaging PWI), susceptibility-weighted imaging. SNR (signal-to-noise ratio) grows with the increase of magnetic field in MR imaging , may be used to improve spatial resolution, reduce acquisition time, but there is no evidence that a 3T MR is more efficient in detecting or staging of a neoplasm as compared to a 1,5T (10, 11, 12). Meanwhile, 7T MR are currently used in scientific research and not in clinical practice. Functional imaging modalities go beyond morphological/anatomical assessment to quantitative and qualitative assessment of physiologic and biochemical processes in vivo. This is important because functional and metabolic changes of tissue/tumour, both on the molecular and functional level, are present much before structural lesions possible to be visualised in classical imaging. Besides, they allow for more precise characterisation of the pathologic process, including differentiation between benign and malignant lesions, which often look very much alike in structural imaging studies. Magnetic resonance spectroscopy (MRS) allows to define the metabolic composition of tissue in vivo in a non-invasive way. Proton magnetic resonance spectroscopy (1HMRS) is the most common, but 13C or 31P is possible, too. 1HMRS is used routinely for brain imaging and prostate imaging. The examination may be performed by the single voxel method (SVS – single voxel spectroscopy) or multi-voxel method (CSI chemical shift imaging). The latter allows for examination of a bigger area. An important drawback of 1HMRS is the possibility to identify a relatively low number of metabolites in clinical MRI systems up to 3T. In malignant tumours, an increased level of choline is observed. In brain tumours the level of choline correlates with cellular density and indices of cell proliferation. Frequently, the choline level is connected to increased aggressiveness of the neoplasm. The most important modalities for delineation of the grade of malignancy and diagnosis of residual or recurrence brain tumours are 1HMRS and perfusion MRI (PWI). Prostate spectroscopy is useful especially in detection of cancer and recurrence. Swindle et al in 2003 (14) assessed sensitivity of 1HMRS in detection of prostate cancer as 97% and its specificity as 88%. In prostate cancer (Cho+Cr)/Citrate ratio correlates with Gleason grade (15). Application of 1HMRS in differential diagnosis of breast lesions is limited mainly by voxel dimensions and difficulties in fat suppression. Tumour vascularity is visualised by dynamic studies after intravenous administration of a contrast agent, including perfusion and contrast-enhanced angiography. Angio-MR without contrast enhancement is rarely applied for assessment of tumour vascularisation. Contrast-enhanced dynamic ultrasound, CT and MRI (DCE) allow for evaluation of neoangiogenesis/tumour vascularity in vivo in a non-invasive and reproducible way (16, 17). Imaging of tumour vascularity improves detection and diagnosis of neoplasm, monitoring of treatment response, identification of persistent disease and recurrence and it may also be a prognostic factor before and after treatment (18, 19). While passing through the capillary bed, a bolus of a low-molecular-weight contrast agent (a group of contrast agents commonly applied in clinical practice) is temporarily only in the vascular bed. This “first pass” of a contrast agent is visualised by perfusion CT and MRI (PWI). In oncologic radiology perfusion studies are performed much more frequently with MRI than CT.
Apart from the brain and spinal cord where there is the blood-brain barrier as well as testis and retina, contrast agents pass to extravascular-extracellular space (EES) at the rate which depends on permeability of the microvessels, their surface and blood flow (20). It is considered that in tumours 12 to 45% of contrast agent may pass to EES during the first pass (21). 1. Methods based on magnetic susceptibility (Dynamic Susceptibility Contrast Enhanced MRI = DSCE MRI). These dynamic T2*-weighted methods sensitive to the vascular phase of contrast agent delivery which visualise tissue perfusion and blood volume. The examination is performed during the first pass of the contrast material, applying the SE T2-weighted sequences, which are more sensitive to the perfusion in small vessels or GRE EPI T2*-weighted sequences, equally sensitive to the perfusion in small and big vessels. The examination provides parametric maps blood volume, blood flow and transit time. Data on perfusion obtained from DSCE MRI correlate with the degree of malignancy of the tumour (tumour grade) and vessel density (16, 17). This method is especially useful in diagnosis of brain disorders, including neuro-oncology. It is applied in differential diagnosis neoplasm vs. non-neoplasm, in identification of the tumour grade, selection of a biopsy place, treatment monitoring (radiotherapy, chemotherapy), prognosis. 2. Relaxivity-based methods – Dynamic Contrast Enhanced MRI = DCE MRI, so-called T1-methods sensitive to the presence of the contrast agent in EES, which visualise microvessel perfusion, permeability, extracellular leakage space. The examination applied T1-weighted sequences sensitive to presence of the contrast agent in the extracellular space and in vessels. This examination provides information on: blood volume, microvessel permeability (Ktrans), capillary surface area, leakage space, which correlate with tumour grade, microvessel density, vascular endothelial growth factor (VEGF) expression (16, 17). The examination is applied for detection and characterisation of tumours, predicting response to treatment, monitoring response to treatment, detection of recurrences most frequently in brain tumours, breast, prostate, liver, lung, rectal and cervical cancer. In MRI mammography visualisation of the cancer depends mainly on neoangiogenesis associated with the tumour. MRI mammography is very sensitive in detection of invasive cancer: almost 100% (lower for DCIS). The negative predictive value is high, too. The main problem of this modality concerns false positive results. Adding MR diffusion weighted imaging (DWI – MR) may improve specificity of the MR mammography and its sensitivity in detection of DCIS and highly-differentiated invasive cancers. 1. Before BCT to identify multifocal or multicentric disease and assessment of the tumour?s size. 2. Metastases to the axillar lymph nodes from unknown primary malignancy. 3. “Screening” in women of breast cancer risk groups (especially BRCA1 and BRCA2 mutations). 5. Assessment of residual disease. Dynamic studies are also essential in diagnosis of prostate cancer, because mean blood flow and interstitial distribution volume are significantly greater in prostate cancer than in normal peripheral zone (22). Imaging of the tumour vascularisation is especially useful in assessment of effects of anti-angiogenic and antivascular agents. Speaking of studies with intravenous administration of contrast agents, one has to mention at least superficial organ-specific hepatotropic paramagnetic contrast agents (Gd EOB DTPA (Primovist), Gd BOPTA (MultiHance), Mn-DPDP (Teslascan)) which improve efficiency of MRI in diagnosis of metastases in the liver. DWI (diffusion weighted imaging) MR explores the random motion of water molecules, especially in the extracellular space but also inside cells and vessels. Diffusion of water in biological systems is affected by biophysical features of tissues, including: size and shape of extracellular space, which depends on size and density of cells and other factors, tissue architecture, as well as integrity of cell membranes and water exchange between the extracellular and intracellular spaces. DWI MRI is considered to visualise indirectly the microstructure of tissues. The first diffusion-weighted imaging sequence was developed in 1965 by Stejskal and Tanner (23), who added couple symmetric diffusion gradients to SE T2-weighted sequences. Diffusion-weighted images are described by the b coefficient (s/mm2), which depends on the diffusion gradients amplitude (G), gradient duration and time between two gradients. DWI-MR is a non-invasive modality, which does not require contrast agent and is quite short (1-5 minutes). The contrast in diffusion weighted images depends on differences in mobility of water molecules. Voxels, in which mobility of water molecules is markedly reduced are a source of high signal intensity (SI) and those in which water molecules are freely mobile – low signal intensity. Data of diffusion-weighted sequences are presented as diffusion-weighted images, but they also allow for qualitative assessment of diffusion using the ADC (apparent diffusion coefficient). ADC has its unit (mm2/s), it is calculated for each voxel and displayed in the form of parametric maps, it is independent from the magnetic field strength and it eliminates the so-called T2-shine-through effect, characteristic of DWI. ADC measurement is a quantitative, objective parameter which describes normal or pathological tissue. For years, MR DWI has had a stable position in neuroradiology, especially in diagnostics of cerebrovascular disease, traumas, brain tumours and epilepsy. DWI is a very sensitive method of detecting acute brain infarction manifested with diffusion restriction. Introduction of the EPI (echo planar imaging) sequence, high amplitude gradients and parallel imaging allowed for application of this method outside the brain, also – or mainly – in oncology. Diffusion-weighted imaging is especially important in differentiating benign from malignant lesions, staging, assessment of treatment response and identification of recurrence, but also as a prognostic and predictive factor. It is believed that in malignant tumours diffusion restriction both in extracellular and intracellular space is due to high cellularity, increased nucleus to cytoplasm ratio, increased quantity of protein macromolecules, irregular, tortuous shape of extracellular space (6, 24, 25, 26). Diffusion restriction in DWI-MR is defined as high signal intensity in high b value DWI images (outside the brain usually > 750 s/mm2) and low signal intensity in ADC maps. Unfortunately, restricted diffusion is not specific for malignancies and may occur in some benign lesions (e.g. high cellularity FNH and liver adenomas), as well as some infection or inflammatory processes (27). On the other hand, low cellular, cystic, mucous, necrotic neoplasms do not restrict diffusion – at least in parts of the tumour. Visualisation of a lesion in DWI/ADC images depends not only on the features of composition and structure of the tumour, but also on characteristics of the tissue in which the neoplasm is located. In organs of typically high signal intensity (SI) in high b value diffusion-weighted images and low in ADS maps (e.g. spleen, tonsils, testicles), diagnosis of a neoplasm may be much more difficult. Sensitivity of DWI in detecting liver metastases is estimated at 74-100% and its specificity at 74-100% (28). Low b value (50, 100 s/mm2) diffusion-weighted images , on which vessels have a very low signal intensity (black blood technique) are currently regarded as the most sensitive method of detecting liver metastases. Lung MRI has been performed for a short time now, but its results in diagnosing lung cancers and differentiating benign and malignant lung nodules are promising. In their paper published in 2009 Qi LP et al (29) wrote: “On the basis of our preliminary data, we conclude that lung cancers were easily visualized on DWI and that it was feasible to differentiate lung cancer from POC (postobstructive collapse) by DWI”. Comparing DWI/ADC and FDG PET-CT in differential diagnosis of lung modules, Mori et al. (30) and Ohba et al. (31) concluded that the ADC coefficient is at least equally efficient in differentiating benign and malignant lesions in the lung ad SUV measured in FDG PET-CT ADC values are significantly lower in prostate cancer in peripheral and transitional zone than in non cancer prostate tissue (32). Residual/recurrent tumours have generally lower ADC values than treatment induced lesions, including post-radiation lesions. Rezek et al (33) differentiated residual/recurrent head neck tumours and posttreatment lesions with accuracy of 87%, sensitivity of 84%, specificity of 90%, PPV of 94%, NPV of 76% the threshold value of ADC 1, x 10–3 mm2/s. DTI (diffusion tensor imaging) presenting anisotropic diffusion is currently applied mainly for imaging of the white matter tract in brain and spinal cord. Despite the many modalities, non-invasive diagnosis of metastases to lymph nodes remains a diagnostic problem. In classical imaging, the size of the node is assessed (its short axis), its size (in the normal lymph node the ratio of the long and short axes, so-called Solbiati coefficient is < 2), its borders, presence of fatty tissue in the lymph node?s hilum, internal structure (presence of necrosis is a strong indication of a metastasis in the lymph node). Ultrasmall superparamegnetic iron oxide (USPIO), with which great hopes for improved efficiency of detection of metastases to lymph nodes were associated, are registered neither by FDA (US Food and Drug Administration) nor EMEA (European Medicines Agency). DWI is currently an important method of non-invasive examination of lymph nodes. Metastatic lymph nodes are usually characterised by increased cellularity and consequently decreased ADC value and restricted diffusion. Although necrosis in a metastasis in a lymph node causes faster diffusion and increased ADC value, but necrotic areas may be easily identified in classical MRI and excluded from ADC calculations. Sensitivity and specificity of the method in detecting metastases from head and neck squamous cell carcinoma to lymph nodes is estimated respectively at: 84-98% and 88-94% (34, 35). NPV of 97% in assessment of mediastinal lymph nodes in patients with non-small-cell lung cancer was reported by Hasegawa et al in 2008 (36). Especially highly cellular lymph nodes in patients with lymphoma and leukemia are clearly visible in diffusion-weighted whole body MRI. The golden standard of whole-body oncologic studies is FDG-PET, but MRI is applied for this examination more and more often. Whole-body MRI protocols are not standardised, they usually include T1-weighted images with and without contrast enhancement, T2-weighted images with fat suppression and diffusion-weighted imaging (DWI/ADC). DWI with a background-supression technique (DWIBS) is especially interesting for whole-body imaging in patients with malignancies. This technique was described for the first time in 2004 by Takahara et al (37). In Gliwice branch of M. Skłodowska-Curie Memorial Cancer Center – Institute an additional post-contrast tri-phase liver examination and spine examination after iv administration of a contrast agent are performed. Whole-body MRI with DWI/ADC is applied in oncology, just like FDG/PET, to detect and stage of the malignancy. Although recently efficacy of these methods has been compared for many neoplasm, the data is still too small and further studies are necessary. In the non-small cell lung cancer, whole body MR with DWI/ADC may be at least equally efficient in identification of N-staging and distant metastases (M-staging) as FDG PET (38, 39, 40). Sensitivity DWI-MR in detecting bone metastases is estimated at 82-92% and its specificity at 76-90% (41, 42, 43, 44). In patients after treatment it is necessary to differentiate neoplastic tissue not only from normal tissues, but also from post-treatment lesions (expected ones and complications) and inflammations. A very important factor for correct assessment is the time elapsed from completion of the therapy and the examination aimed at assessment of the potential persistent neoplasm. After surgical treatment of a brain tumour, the first MRI with intravenous contrast administration and diffusion-weighted imaging (DWI/ADC) at best should be performed within the first 24 hours after the procedure, but after radiotherapy the time is much longer, e.g. in the case of head and neck cancers – at least 3-4 months. In diagnosing post-treatment lesions and exclusion of recurrence, DW MRI may more successful than FDG PET/CT. Increased uptake of FDG and no diffusion restriction suggest post-treatment/inflammatory lesions and disprove neoplastic infiltration (45). Early identification of patients with a poor treatment response offers a chance for successful treatment. It is an important component of the so-called individualised therapy. Main systems of follow-up of treatment response in neoplastic tumours, such as RECIST (Response Evaluation Criteria in Solid Tumours – uni-dimensional tumour size measurements) or WHO-criteria (bi-dimensional tumour size measurements) are based on measurements of the tumour?s size on anatomic CT or MR images. The main drawback of these criteria lies in the fact that tumour?s size changes quite late. Additionally, these methods are virtually useless in assessment of results of therapeutic methods which do not involve change of the tumour?s size, e.g. : thermoablation, chemoembolisation, radiosurgery and some chemotherapeutic agents (including sorafenib, erlotinib). This is why assessment of treatment response in cancer patients involves now commonly other parameters and methods than the simple measurements of radiation attenuation in a CT examination, turning to functional studies: dynamic studies, perfusion, diffusion-weighted imaging (DWI/ADC) or MR spectroscopy. MR is a method that allows for measurement of biological activity of anti-cancer agents, e.g. DCE-MRI is applied for assessment of the effect of anti-angiogenic and anti-vascular agents on the tumour microcirculation. Response to therapy is manifested as a decrease in rCBV and a decrease of permeability (a decreased rate of CM leakage) even at the early stage of treatment. A change of kinetics of contrast enhancement also precedes markedly changes of the tumour?s size. Reduction or disappearance of contrast enhancement during treatment is a symptom of regression of the neoplasm, but it must be remembered that assessment of tumour response with angiogenesis imaging must be different in the case of application of anti-angiogenic or anti-vascular agents than in the case of other chemotherapeutic agents. DCE MRI which visualises tissue perfusion and permeability is consider to be a pharmacokinetic indicator of activity of anti-angiogenic and antivascular agents (46). Assessment of changes in diffusion, especially the ADC value is a very promising method of early evaluation of oncologic treatment response. In general, successful treatment of a neoplasm leads to faster diffusion and increase ADC value within the tumous (26, 47, 48). In a group of patients with liver metastases of colorectal cancer, Taouli and Koh (28) did not observe any increase of ADC in any non-responder, while in all cases of at least partial response to treatment involved a visible increase of the ADC value. Temporary diffusion reduction and decrease of the ADC value is sometimes observed at the beginning of treatment of various neoplasm, most often in the first dozens of hours after the first cycle of chemotherapy. Decreased ADC value during successful treatment has been also observed in therapy with anti-angiogenic agents is explained with a decrease of extracellular space due to reduction of the vasogenic oedema (26). Hamstra et al (49, 50) have suggested parametric response mapping of diffusion (PRM ADC) as a tool to assess response to treatment of brain tumours which allows for determination of the fraction of tumour voxel, in which ADC value has changed significantly during treatments This tool can be applied in head and neck neoplasms, as well as breast cancer, too. Evaluation of the response to the neoadjuvant chemotherapy in breast cancer seems nowadays the main application of 1HMRS in MR mammography. Decreased choline level precedes changes in size and morphology of the tumour. According to preliminary reports, choline may be able to predict very early whether or not the patient will have a response (51). An interesting application of DWI/ADC concerns prediction of the response of a tumour to chemotherapy and radiotherapy. In general, tumours of lower pre-treatment ADC values respond better to chemotherapy/radiotherapy than those of higher ADC values. It is commonly explained by the fact that necrosis (including microscopic necrosis) causes an increase in the ADC value and in the necrotic tumours hypoxia, acidosis, low perfusion are usually present and these factors cause resistance to chemotherapy and radiotherapy (52, 53, 54, 55). Information obtained in dynamic contrast studies, too, may be used for predicting treatment response. In their paper of 2001, George et al. reported based on DCE-MRI that rectal cancer with high permeability responds to chemotherapy better than in the case of lower permeability (56). modern techniques of radiology and diagnostic imaging allow for structural and functional imaging of a neoplasm. Functional diagnostic imaging provides many new and important data for treatment of patients with malignancies. Introduction of these methods to everyday clinical practice and their development require close cooperation of radiologists with other members of the diagnostic and therapeutic staff. 1. Dee KE, Sickles EA: Medical audit of diagnostic mammography examinations: comparison with screening outcomes obtained concurrently. AJRAm J Roentgenol 2001; 176 (3): 729-33. 2. Bartella L, Smith CS, Dershaw DD, Loberman L: Imaging Brest cancer Radiol Clin N Am 2007; 45: (45-67). 3. Stadlbauer A, Moser E, Gruber S et al. : Improved delineation of brain tumors: an automated method for segmentation based on pathologic changes of 1H-MRSI methablites in gliomas. Neuroimage 2004; 23 (2): 454-61. 4. Pirzkall A, McKnight TR, Grave EE et al. : MR spectroscopy guided target delineation for high-grade gliomas. Int J Radiat Oncol Biol Phys 2001; 50: 915-928. 5. Nimsky C, Grummich P, Sorensen AG et al. : Visualization of the pyramidal tract in glioma surgery by integrating diffusion tensor imaging in functional neuronavigation. Zentralbl Neurochir 2005; 66 (3): 133-41. 6. Kwee TC, Takahara T, Klomp DWJ, Luijten: Cancer imaging: novel concepts in clinical magnetic resonance imaging J Intern Med 2010; 268:120-132. 7. Danchaivijitr N, Waldman AD, Tozer DJ: Low-grade gliomas: Do changes in rCBV measurements atlongitudinal perfusion-weighted MR imaging predict malignant transformation. Radiology 2008; 247: 170-178. 8. Law M, Oh S, Babb JS et al. : Lowa-grade gliomas:dynamic susceptibility – weighted contrast-enhanced perfusion MR imaging-prediction of patient clinical response.Radiology 2006; 238 (2): 658-67. 9. Hoffman JM, Gambir SS Molecular imaging: The Visio and opportunity for radiology in the future. Radiology 2007; 44: 39-47. 10. Krautmacher C, Willinek WA, Tschampa HJ et al. : Brain tumors: full-and half-dose contrast enhanced MR imaging at 3T compared with 1,5T – initial experience. Radiology 2005; 237: 1014-9. 11. Kuhl CK, JostP, Morakkabati N et al. : Contrast enhanced MR imaging of the breast at 3,0 and 1,5T in the same patients: initial experience. Radiology 2006; 239: 666-76. 12. Van Falkenhausen MM, Lutterbey G, Morakkabati-Spitz N et al. : High-field strength MR imaging of the liver at 3.0T: intraindividualcomparative study with MR imaging 1,5T. Radiology 2006; 241: 156-66. 13. Torigian DA, Huang SS, Houseni M, Alami A: Functional imaging of cancer with emphasis on molecular techniques. CA Cancer J Clin 2007; 57: 206-24. 14. Swindle P, McCredie S, Russel P et al. : Pathologic characterization of human prostate tissue with proton MR spectroscopy. Radiology 2003; 228: 144-151. 15. Zakian KL, Sircar K, Hricak H et al. : Correlation of proton MR spectroscopic imaging with gleason score based on step-section pathologic analysis after radical prostatectomy. Radiology 2005; 234 (3): 804-14. 16. Padhani AR: Dynamic contrast-enhancement MR imaging. Cancer Imaging 2000; 1: 52-63. 17. Hylton N: Dynamic contrast-enhanced magnetic resonance imaging as an imaging biomarker. J Clin Oncol 2006; 24: 3293-8. 18. Aksoy FG, Lev MH: Dynamic contrast – enhanced brain perfusion imaging: techniques and clinical applications. SeminUltrasound CT MR 2000; 21: 462-477. 19. Miles KA: Tumor angiogenesis and its relation to contrast enhancement on computed tomography: a review. Rur J Radiol 1999; 30: 198-205. 20. Padhani AR, Leach MO: Antivascular cancer treatments: functional assessments by dynamic contrast enhanced magnetic resonance imaging. Abdominal Imaging 2005; 30: 324-341. 21. Daldrup HE, Shames DM, Husseini W et al. : Quantification of the extraction fraction for gadopentate across breast cancer capillaries. Magn Reson Med 1998; 40: 537-543. 22. Buckley DL, Roberts C, Parker GJ et al. : Prostate cancer: evaluation of vascular characteristics with dynamic contras-enhanced T1-weighted imaging – initial experience. Radiology 2004; 233: 709-15. 23. Stejskal EO, Tanner JE: Spin diffusion measurements : spin-echo In the presence of a time dependent field gradient. J Chem Phys 1965; 42: 288-292. 24. 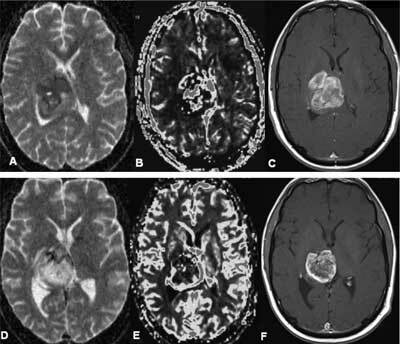 Provenzale JM, Mukundan S, Barboriak DP: Diffusion-weighted and perfusion MR imaging for brain tumor charakterization and assessment of treatment response. Radiology 2006; 239: 632-49. 25. Padhani AR, Liu G, Koh DM et al. : Diffusion-weighted magnetic resonance imaging as a cancer biomarker :consensus and recommendations. Neoplasia 2009; 11: 102-25. 26. Koh DM, Collins DJ: Diffusion weighted MRI in the body: applications and challenges in oncology. AJR Am J Roentgenol 2007; 188 (6): 1622-35. 27. Fuerlein S, Pauls S, Juchems MS et al. : Pitfalls in abdominal diffusion-weighted imaging : how predictive is restricted water diffusion for malignancy. AJR Am J Roentgenol 2009; 193: 1070-6. 28. Taouli B, Koh DM: Diffusion-weighted MR imaging of the liver Radiology 2010; 254 (1): 47-67. 29. Qi LP, Zhang XP, Tang L et al. : Using diffusion-weighted MR imaging for tumor detection in the collapsed lung: a preliminary study. Eur Radiol 2009; 19 (2): 333-41. 30. Mori T, Nomori H, Ikeda K et al. : Diffusion-weighted magnetic resonance imaging for diagnosing malignant pulmonary nodules/masses: comparison woth positron emission tomography. J Thorac Oncol 2008; 3: 358-64. 31. Ohba Y, Nomori H, Mori T et al. : Is diffusion-weighted magnetic resonance imaging superior to positron emission tomography with fludeoxyglucose F18 in imaging non-small cell lung cancer? J Thorac Cardiovasc Surg 2009; 138: 439-45. 32. Sato Ch, Naganawa S, Nakamara T et al. : Differentiation of noncancerous tissue and cancer lesions by apparent diffusion coefficient values in transition and peripheral zone of the prostate. J Mag Reson Imaging 2005; 21: 258-262. 33. Razek AAA, Kandeel AY, Soliman N et al. 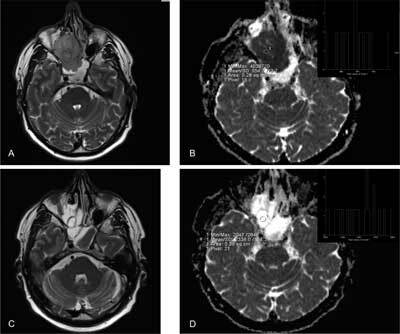 : Role of diffusion-weighted echo planar MR imaging in differentiation of residual or recurrent head and neck tumors and posttreatment changes. AJNR 2007; 28: 1146-1152. 34. Razek AAA, Soliman NY, Elkhamary A et al. : Role of diffusion-weighted MR imaging in cervical lymphadenopathy. Eur Radiol 2006; 16 (7): 1468-77. 35. Vandecaveye V, De Keyzer F, Vander Poorten V et al. : Head and neck squamous cell carcinoma: value of diffusion-weighted MR imaging for nodal staging Radiology 2009; 251 (1): 134-46. 36. Hasegawa I, Boiselle PM, Kubawara K et al. : Mediastinal lymph nodes in patients non-small cell lung cancer: preliminary experience with diffusion weighted MR imaging. J Thorac Imaging 2008; 23: 157-161. 37. Takahara T, Imai Y, Yamashita T et al. : Diffusion weighted whole body imaging with background body signal suppression (DWIBS): technical improvement using free breathing, STIR and high resolution 3D display. Radiat Med 2004; 22: 275-82. 38. Takenaka D, Ohno Y, Matsumoto K et al. : Detection of bone metastases In non-small cell lung cancer patients: comparison of whole body diffusion-weighted imaging (DWI) whole body MR imaging without and with DWI, whole body FDG-PET/CT and bone scintygraphy. JMagn Reson Imaging 2009; 30: 298-308. 39. Nomori H, Mori T, Ikeda K et al. : Diffusion-weighted magnetic resonance imaging can be use in place of positron emission tomography for N staging of non-small cell lung cancer with fewer false-positive results. J Thorac Cardiovasc Surg 2008; 135: 816-22. 40. Ohno Y, Koyama H, Onishi Y et al. : Non-small cell lung cancer: whole-body MR examination for M-stage assessment – utility for whole-body diffusion-weighted imaging compared with integratedFDG PET/CT. Radiology 2008; 248: 643-54. 41. Steinborn M M, Heuck AF, Tiling R et al. : Whole body bone marrow MRI in patients with metastatic disease to the skeletal system. J Comput Assist Tomogr 1999; 23: 123-129. 42. Daldrup-Link HE, Franzius C, Link TM et al. : Whole-body MR imaging for detection of bone metastases in children and young adults: comparison with skeletal scintigraphy and FDG PET. AJR Am J Roentgenol 2001; 177: 229-236. 43. Antoch G, Saoudi N, Kuehl H et al. : Accuracy of whole-body dual-modality fluorine-18-2-fluoro-2-deoxy-D-glucose positron emission tomography and computed tomography (FDG-PET/CT) for tumor staging in solid tumors: comparison with CT and PET. J Clin Oncol 2004; 22: 4357-4368. 44. Schmidt GP, Schoenberg SO, Schmid R et al. : Screening for bone metastases: whole-body MRI using a 32-channel system versus dual-modality PET-CT. Eur Radiol 2007; 17 (4): 939-949. 45. Vandecaveye V, de Keyzer F, Vander Poorten V et al. : Evaluation of the larynx for tumour recurrence by diffusion-weighted MRI after radiotherapy: initial experience in four cases. Br J Radiol 2006; 79: 681-687. 46. Padhani AR: MRI for assessing antivascular cancer treatments. British Journal of Radiology 2003; 76: S60-S80. 47. Moffat BA, Hall DE, Stojanowska J et al. : Diffusion imaging for evaluation of tumor therapies in preclinical animal models. MAGMA 2004; 17: 249-259. 48. Chen CY, Li CW, Kuo YT et al. : Early response of hepatocellular carcinoma to transcatheter arterial chemoembolization: choline levels and MR diffusion constatnts – initial experience. Radiology 2006; 239: 448-456. 49. Hamstra DA, Galban CJ, Meyer CR et al. : Functional diffusion map as an early imaging biomarker for high-grade glioma: correlation with conventional radiologic response and overall survival. JClin Oncol 2008; 26: 3387-95. 50. Hamstra DA, Rehemtulla A, Ross BD: Diffusion magnetic resonance imaging: a biomarker for treatment response in oncology. J Clin Oncol 2007; 25: 4104-9. 51. Meisamy S, Bolan PJ, Baker EH et al. : Neoadjuvant chemotherapy of locally advanced breast cancer: predicting response with in vivo (1) HMR spectroscopy – a pilot study at 4T. Radiology 2004; 233: 424-31. 52. Dzik-Jurasz A, Domening C, George M et al. : Diffusion MR for prediction of response of rectal cancer to chemoradiation. Lancet 2002; 360: 307-308. 53. De Vries AF, Kresmer C, Hein AP et al. : Tumor microcirculation and diffusion predict therapy outcome for primary rectal carcinoma Int J Radiat Oncol Biol Phys 2003; 56: 958-965. 54. Mardor Y, Roth Y, Ochershvilli A et al. : Pretreatment prediction of brain tumor?s response to radiation therapy using high b-value diffusion weighted MRI. Neoplasia 2004; 6: 136-142. 55. Koh DM, Scurr E, Collins DJ et al. : Colorectalhepatic metastases: quantitative measurements using single-shot echo-planar diffusion-weighted MR imaging Eur Radiol 2006; 16: 1898-1905. 56. George ML, Dzik-Jurasz AS, Padhani AR et al. : Non-invasive methods of assessing angiogenesis and their value in predicting response to treatment in colorectal cancer. Br J Surg 2001; 88: 1628-1636.